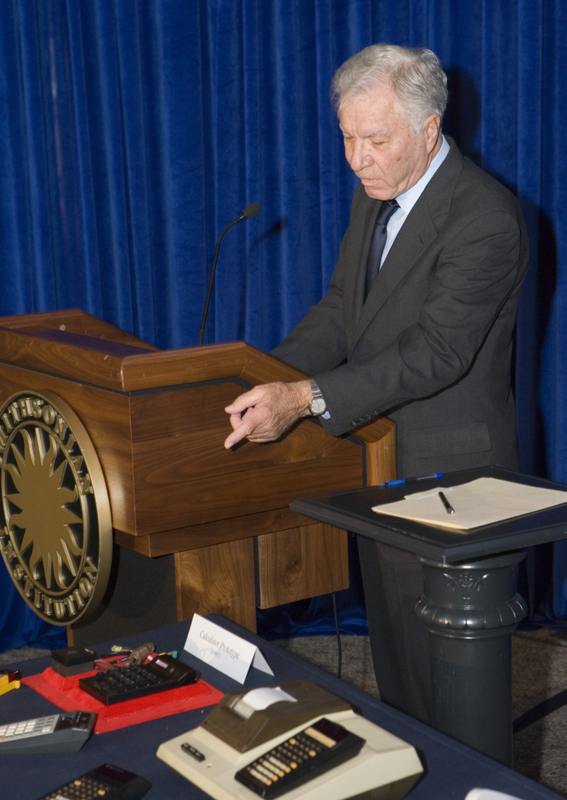 WASHINGTON (September 25, 2007) – In a special ceremony today the Smithsonian's National Museum of American History joined with Texas Instruments to mark the 40th anniversary of the company's invention of the electronic hand-held calculator with a donation of a series of the company's historical and current educational technology objects to the museum's Information Technology collections. "The National Museum of American History has a significant role in preserving the innovations that have shaped math education throughout history," said museum director Brent D. Glass. "Texas Instruments is a leader in math education, and we hope its history of invention and innovation will inspire visitors and scholars." The museum will accept into its permanent collection two of the first programmable calculators from the 1970s, the TI-58 and TI-59; a scientific calculator, the TI-30; a TI-Navigator Classroom System; and the new TI-Nspire math learning handhelds and computer software. These new acquisitions will join objects and materials previously donated by TI, including a prototype for the world's first miniature electronic (hand-held) calculator for which TI filed the patent application in 1967. The prototype performed four functions (addition, subtraction, multiplication and division), had 12 bytes of memory, ran on batteries and was cased in solid aluminum, weighing nearly 3 pounds. It was a major advancement compared to existing electronic calculators, which were approximately the size of a typewriter and needed to be plugged into a power source. The ceremony featured two of the electronic hand-held calculator inventors, Jerry Merryman and James Van Tassel, and President of Texas Instruments Education Technology division Melendy Lovett, who donated the TI objects to the collection. "We are proud of our long history of working with the Smithsonian to document and preserve the continuing evolution of educational technology," said Lovett. "TI is committed to creating new technologies to help students visualize, learn and understand math more deeply." Examples from the Museum’s extensive collection of education technology can be viewed at the Chip Collection Web site and the new online exhibition, “Mobilizing Minds: Teaching Math and Science in the Age of Sputnik." The National Museum of American History collects, preserves and displays American heritage in the areas of social, political, cultural, scientific and military history. Documenting the American experience from Colonial times to the present, the Museum looks at growth and change in the United States. The Museum is closed for major renovations and will re-open in summer 2008. For information about the Museum, please visit http://americanhistory.si.edu or call Smithsonian Information at (202) 633-1000, (202) 633-5285 (TTY). © Joerg Woerner, October 14, 2007. No reprints without written permission.